HONESTY, INTEGRITY, COMPASSION. Those are the bywords of my practice. 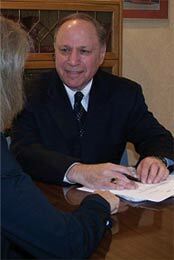 I’ve been in practice for over 30 years, a practice limited to Real Estate (residential and commercial purchases and sales, as well as refinances), Wills and Estate Planning, Probate, forming Limited Liability Companies and Corporations and representing people who buy or sell Small Businesses,. My undergraduate degree is in Accounting, I have a Masters of Law in Taxation from NYU Law School, and during tax season, I do income tax returns. The bulk of my practice is Real Estate. I believe that all of my clients come to realize that I represent them zealously, in a calm, professional manner, with sensitivity to their requirements. Part of that sensitivity is understanding the need for communication. I make an attempt to meet with each and every new client when I am retained. I accomplish a great deal in that initial meeting, particularly with people who are buying or selling a home for the first time. I take a lot of time to explain everything that will happen in the transaction, from beginning to end. Also, my limited practice means that I am generally in the office, as I do not spend any part of my day in Court, and I am generally available during the work week, for meetings and phone calls. So, if you need an attorney to handle the practice areas I mentioned, call my office and ask to speak with me. Chances are pretty decent that I’m going to be there to talk to you, just as I’ve said, and when you talk to me, I think that you’re going to be satisfied enough to want to retain my services.